Wheelchair ramps are essential to accessibility and freedom for mobility chair and scooter users. Yet, when wheelchair ramps are not designed and constructed properly, they can be dangerous and difficult to use. This article offers tips on what to look for in a ramp so you can find one that is safe and suitable for your needs. The most important aspect of a ramp is its degree of incline. Steep ramps are dangerous because they are difficult to climb and pose the risk of tipping backwards. The lower its incline, the easier and safer a ramp is to use. The maximum acceptable incline for a ramp is one inch of rise for every twelve inches of length. The ramp should not rise more than six inches off of the ground’s surface. There must be a level landing at the top of the ramp and where the ramp meets the ground. The landing can be an existing surface such as a porch or sidewalk or it can be constructed as part of the ramp. Landings should be at least the same width as the ramp and 60 inches long in order to accommodate the entire wheelchair. If the landing is in front of a doorway, it should also provide enough space for you to open the door. In general, providing a gradual transition between a ramp and its landing is necessary for optimal safety. Although the weight of a wheelchair is normally on its rear wheels, when a wheelchair is on a ramp, the weight transitions to the caster wheels in the front. When the front wheels hit the landing, the wheelchair can come to a sudden stop, causing the wheelchair user to fly forward. As such, having a transition to landing is essential for your safety. No matter where an access ramp is located, it should have a non-skid surface. The surfaces of outdoor ramps should be constructed so that water cannot accumulate on them. Accumulation of water on landings should also be kept in mind when a ramp is designed and constructed. There are ramps designed for manual, electric, occupied, and unoccupied wheelchairs. Check the weight specifications of ramps to ensure that they can handle both your weight and the weight of your wheelchair. Handrails are required for public ramps, but for personal ramps, it is up to the user whether or not they need them. Some wheelchair users are unable to push themselves up a ramp on their own and need hand rails to pull themselves up. Wheelchair users can also hold onto a ramp’s hand rails anytime they feel tired or unsteady. If the handrails are made of wood, care must be taken to ensure that they do not have splinters. 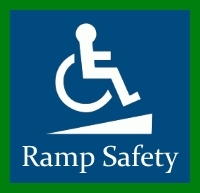 For more information on ramp considerations, click here: Wheel Chair Ramps.